I am really excited today to announce the release of the High Road Low Road Quilt Pattern! The pattern will be on sale for $8 (20% off full price) for one week (through June 8th) through my Craftsy and Etsy stores. I reworked the piecing technique from my Beacon quilt design to create less waste, and I ended up with the High Road Low Road quilt block based design. 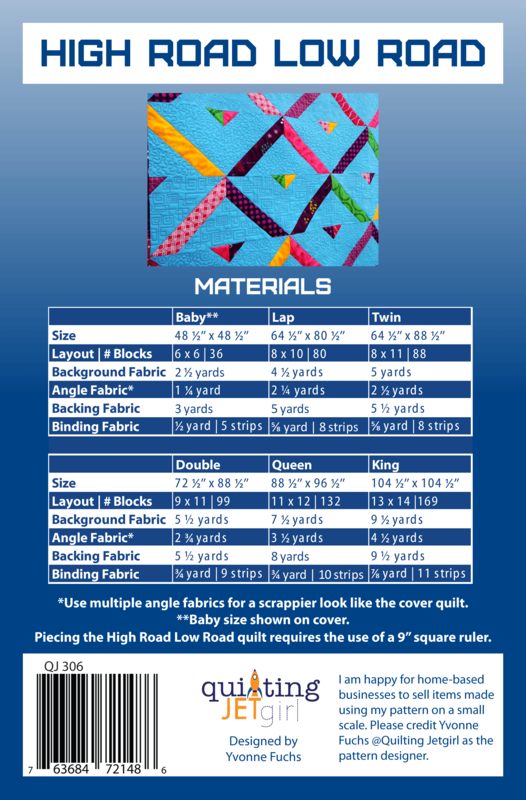 The pattern contains detailed instructions for creating the block and suggestions for how to make your own version of the quilt in 6 different sizes: baby, lap, twin, double, queen, or king. As I was exploring the layout options for this quilt design, I was struck by the up and down / bridge like shapes that this pattern develops. Whether I choose to walk over the bridge or scamper down to stroll along in the stream below, I hope that I remember to enjoy the journey. This quilt offers ample background / negative space for quilting fun, interesting angles, and it is a great stash / scrap buster. If you make a version of the High Road Low Road quilt, I would love to see it! If you are on Instagram, tag me (@QuiltingJetgirl) and any images of your quilt using #HighRoadLowRoadQuilt. Or send an email to jetgirl8(at)gmail(dot)com with a photograph or a link to a blog post about your quilt. I love the simple shapes – lots of possibilities with something like this. Such a fUn happy looking design. Congrats on the pattern release! Love the quilt and the quilting. So summery looking. Congrats on your new pattern release! I really like the variety in quilting, especially 5th row down. Congrats on another fun pattern release! I can already see this is so many different color combo’s. That blue background is very striking! Congrats on another great pattern release! Congrats on yet another quilt pattern! I am so amazed at your never ending talent! This design has so many possiblities! It is a beautiful design and a wonderful quilt pattern! Congratulations on your new pattern Yvonne! It’s really beautiful and has loads of possibilities! Normally I would think of this as a modern art quilt or a quilt for an adult, but as soon as you talked about your shapes as bridges and streams, I immediately saw how much a child would enjoy having this quilt and how much imaginative play it could inspire! I second, third and fourth all the above comments. Congrats on your pattern! It looks awesome. Great quilt! way to go getting another pattern out…no wonder you are jetgirl! I need some of that high energy! I love the colors you used and your quilting is beautiful! What a bright and beautiful quilt. fun shapes! Lots of negative space for your great quilting. Very Very Nice really shows off your quilting…And refreshing to see the blue instead of white background.. happyness04431@yahoo.com. So eye-catching. I like that you provide material requirements for so many sizes. Love the triangles showing up. Beautiful quilt! Congrats on the new pattern. This design really offers great space for quilting motifs as well as lots of interesting possibilities with fabric choices. Great pattern and I can see how nice it would be to showcase some beautiful quilting. Such a fun, modern design – I might have known it was your design even without seeing your name. Great pattern once again – congrats!!! What a fun design! Congrats! Amazing what simple shapes can do! This pattern has so much movement, so many possibilities for quilting. Lovely design. Simply perfect. Love how this evolved from your Beacon pattern. I think all of the negative space is my favorite part of this pattern. You can do so much with it. LOOOOVE your quilt & your explanation on what you see..Beautiful idea! Visiting from BuzzinBumble. Cue name for your quilt. I generally only name my bigger quilts but I always struggle to come up with a name. Lovely quilt, especially the quilting is stunning! It is great to see a pattern with plenty of space for quilting. I love a good scrap buster. Congratulations on another pattern release, and for another lovely quilt too. I could really see a young child enjoying this, definitely lots of potential for imaginative play.